Sam & Tom! host a new night of specially curated comedy, live music and film in Sheffield. 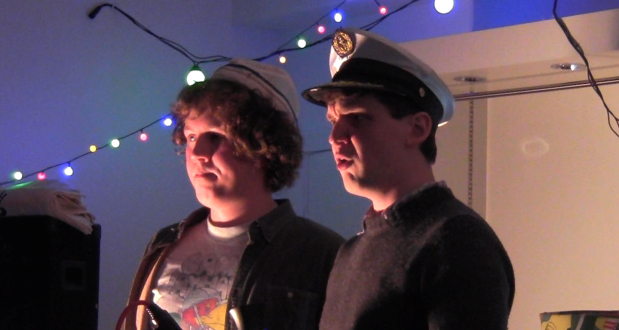 Sam Nicoresti and Tom Burgess are no strangers to comedy. One month ago they had just finished a run at the Gilded Balloon as Staple/face, a name familiar to some as the winners of the inaugural ‘So You Think That’s Funny?’, a sketch competition that saw them beat off names like Beasts and Gein’s Family Giftshop to take the crown (it was actually a glass star which does not sit well as a hat). In our review of their latest Fringe show, we said Staple/face were ‘cementing their place among the best sketch comedy troupes on the circuit’, whilst The Skinny named them as one of their North West Cut of the Fringe alongside Panel Prize Winners Funz & Gamez. And yet, just two months on, the group have split, downsized, rebranded, and returned as something completely new, with a new breed of night to suit. Sam, 22, is one half of the new double-act, Sam & Tom!, a name with arbitrary punctuation to rival the unwebsitable Staple/face – but they insist that this is a new direction, and their regular night will reflect their newfound alternative, experimental nature. They’ve teamed up with a blossoming local arts platform, Hand Of, to create an evening of multimedia mayhem, short film screenings, live music, presentations, and of course, the dreaded ‘sketch comedy’. “We’ve gigged at some excellent nights that do things differently” explains Tom, “There’s S.O.S. and Sham Bodie in Manchester, who go out of their way to eschew the typical ‘comedy night’ format.” The duo explain their night, Boondoggle, which opens at DAda Bar on Tuesday 21 October, will be stranger still. “In essence, we’ve got our hands on a projector” admits Sam, “But there’s a lot more going on than that. We want to get rid of the compere. The idea you need to have a blanket base you can return to, to keep the room warm and allow them to reset between acts. We’re not booking any headliners, or open spots. This new breed of act, for the opening night at least, contains some impressive accolades. 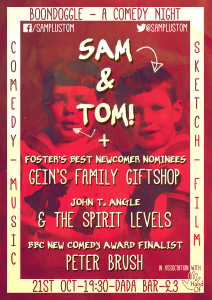 Foster’s Best Newcomer Nominees Gein’s Family Giftshop will be performing PE-kitted sketches from their hit Edinburgh show, with BBC New Comedy Award Finalist Peter Brush holding court on a topic of his choice. Local band John T. Angle & The Spirit Levels provide the jams (but not the jam, as per the terms of their contract), and Sam & Tom! reign above all, like weird child kings. Sheffield’s comedy scene is a vibrant and growing place, with much-loved professional establishments like Last Laugh sitting alongside dedicated independent nights like Alt.Com.Cab. and Square Hole. Sam & Tom’s Boondoggle hopes to fit right in to the ethos of this artistic, innovative city, and aims to provide a welcome break to those who are seeking something different, and something unique. Sam & Tom’s Boondoggle, Tuesday 21 October, Dada Bar, Trippet Lane, Sheffield, 7.30pm, £3 on the door.